Have some FIBERY FUN…One day classes, include all materials and a warm, delicious farm to table style lunch. More classes may be added, so be sure to check back often. Every year we add new classes. In 2020 we will add a soap making class & a leather purse making class. July 23, 2019 (THIS IS A TUESDAY). Needle Felted Wee 2020 Space Monster. Traveling for the class? Below is a list of Hotel, Cabin rental & B&B recommendations. 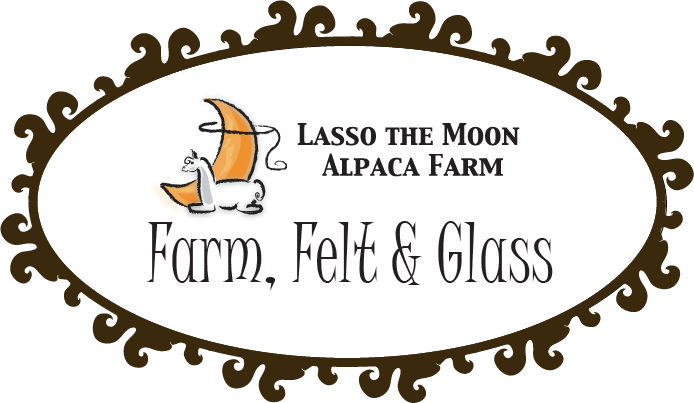 Some of the places listed will give you a discount if you tell them you are taking at Lasso the Moon Alpaca Farm/Lardworks Studio. Paradise Hill Cabins, Winery and Spa Resort, click here to make reservations. Suches Vacation Rentals (Dozens of cabin rental options, plus tree houses! click here to make reservations. 2s Company Cabins, almost walking distance from the farm, click here. Mysty Mountain Inn & Cottages, lovely place, friendly folk, click here.